Illya Woloshyn wears black high top Converse “Chuck Taylor” All Stars in the series. Flash, Jay, and Alpha wander through the “Downworld” seeking a way for Jay to return to the “Upworld”. The Odyssey is a combination adventure and science fiction fantasy series about Jay Ziegler (Illya Woloshyn), an eleven year old kid living in British Columbia with his widowed mother, Val (Janet Hodgkinson). As the series opens, Jay is seen losing a chess game with his one true friend Donna Archipenko (Ashley Rogers) who is very smart, but crippled by polio in one leg. When she asks him what they should do next, Jay hesitates to answer, just as Keith Haldane (Tony Sampson), the leader of a local gang of kids that Jay is trying to get in with rides by on his bicycle. Keith asks Jay if he is coming by the tree fort later and makes fun of the two of them being together. After Keith leaves, Donna chides him, saying that all Keith wants to do is take away Jay’s antique telescope, (passed down to him by his father from his grandfather) and don’t expect her to save him when it happens. But Jay insists that he is just going to show it to the other kids and runs off to his house to get it. As Jay takes the telescope out of its wooden case, he looks at a picture of his father, and says “Sorry, dad.” Later after the telescope is brought and then taken by Keith and his gang as Donna predicted, she tells a dejected Jay, “Don’t get mad, get even.” While she creates a diversion, Jay circles around and climbs into the fort reclaiming the telescope, but he is spotted by Keith and his cronies. Jay tries to escape from them by grabbing onto a rope pulley on the side of the tree fort. Unfortunately the housing of the pulley breaks, causing Jay to fall precipitously to the ground and roll down the ravine, where he hits his head on some rocks, knocking him unconscious. The telescope falls also. Keith catches it, but fearing the consequences of what has happened throws the telescope into the nearby stream. Jay and his friends seek assistance from Feelgood to get past the first checkpoint on their way to the tower. The fall has caused Jay to go into a coma, which is symbolized by Jay descending down into lower regions on a elevator. When Jay exits the elevator, he is in another world, a Downworld society that turns out to be a strange combination of Mad Max, Kafka’s The Trial, the Wizard of Oz, and Orwell’s Animal Farm. The world is populated exclusively by kids who roam around in gangs and have no concept of the terms “home” or “father” when Jay says them. Everything that goes on in the Downworld is somehow based on artifacts or events from Jay’s Upworld life. The Downworld is ruled by a 15 year named Brad, who looks exactly like Jay’s deceased father. When Jay sees posters of him, he figures that Brad must know how he can return to his home in the Upworld. Donna, now called Alpha, is no longer crippled, and is there from Jay’s first steps in the Downworld to help him find his way. Keith is now called Flash, and although in the first episode he still bullies Jay by taking his telescope, by the end of the activities in both the Upworld and Downworld, Keith/Flash changes his mind about things. This is due in part to Jay standing up to him and his remorse about what has happened to Jay (again in both worlds). So Flash/Keith abandons his gang and sets off to help Jay with his quest also. The telescope continues to have great significance in many of the episodes. At the end of the first episode, Jay is dunked in the water by one of Flash’s gang members (played by the same kid who torments him in the Upworld). Instead of swimming back up immediately, Jay swims up to a pool at the edge of the Upworld where he briefly sees an apparition of his mom. “Come home, now” she pleads, but Jay replies, “No, I have to retrieve Dad’s telescope.” “Well, watch out for weirdos,” she warns, mimicking the last words she spoke to him before his fall from the tree. When Jay finally does resurface in the Downworld, Flash returns the telescope right after Jay is pulled out of the water. This corresponds to an operating room crisis for Jay in the Upworld, where he is on the brink of death, but then his condition suddenly stabilizes. Jay tells the monitors that the telescope will solve the problem of the eclipse which has blacked out all sunlight in the Downworld. Throughout the series, actions that happen in the Upworld are mirrored and influenced by those in the Downworld, and vice versa. 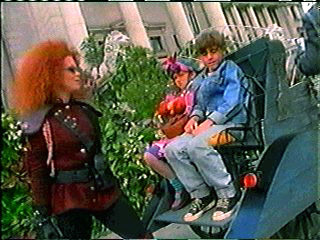 The first season’s episodes are based on attempts by Jay to find the checkpoints that will allow he and his companions to get to the tower to see Brad. But to do this they must escape the pursuing monitors and gangs of kids, some of whom are friendly, some who want to use Jay for their own ends, and some who fear him because of his talk about “big people” and other things that they don’t understand. Meanwhile, in the Upworld, Jay’s condition deteriorates due to a seizure and he is placed in intensive care. Eventually things stabilize, but there is a long recovery period ahead, and the hospital wants to place Jay in its extended care ward, a dark and forbidding place where many comatose patients are kept together. Val is upset by this, and decides to place Jay in an expensive and experimental private care facility called Driftwood, where she must spend many hours working with the staff to try bring Jay back to reality. In the Downworld, Jay, Alpha, and Flash finally get to the tower and find Brad, but he isn’t Jay’s father, and doesn’t even control the tower anymore. The second season begins with Jay discouraged about his lack of progress. Even though he has briefly visited the Upworld, he hasn’t found his home, and continues to wander the Downworld. Artifacts from his Upworld existence keep appearing, and after Jay’s dad appears as an actual character, first in the Downworld and then in the Upworld, the overall plot direction begins to focus on what actually happened to Jay’s dad, and how this has impacted Jay’s life. In the last few episodes, Jay actually begins to emerge from his coma, and his relationships with the people who appear in both worlds causes Jay some real consternation, as he goes back and forth between Upworld lucidity and the comatose state where he is active in the Downworld. Jay seeks information about the location of the last secret checkpoint from Frances X, a trader at the Brad Exchange, where items once belonging to Brad are sold and bartered. The final season seems to be almost an after thought to the series. You get the impression that the network probably decided to renew the show at the last minute, and the writers were caught in the dilemma of figuring out how to continue things. By now the main characters are full grown teenagers, and bear little resemblance to the adolescents appearing in season one. Jay is now completely out of the coma, and the season deals with his attempts to readjust to life in the real world. But this Jay has a harder edge to him, and it is not clear why the fantasy world of the Downworld is even maintained. He begins to see a psychiatrist who tries to counsel him about the transisiton he is going through, but Jay doesn’t trust him or any of the other male adults that his mother associates with. This theme continues throughout the season three episodes. A mostly unhappy Jay also has girl problems as characters who appeared in his Downworld dreams are now actual people in the Upworld. Nevertheless, taken as a whole, The Odyssey is a remarkable series, given its genre as an adventure show for kids. Even though it has a TV rating as acceptable for seven years olds, it is really more suitable for older kids of middle school age. This is due to the violence and kids in peril themes regularly presented in most of the episodes, but also because only an older kid can begin to appreciate many of the complex themes presented during the course of the series. The surreal Downworld of The Odyssey introduces significant issues of fascism, violence, and psychiatry, while exploring the impact of dreams and many of the familiar coming of age themes we are used to seeing in stories about adolescent kids. Series creators Paul Vitols and Warren Easton are to be commended for their work here. The program is well cast, and the principal actors Illya Woloshyn, Ashley Rogers, Tony Sampson, Andrea Nemeth, and Janet Hogkinson all deliver terrific performances. Despite its flaws, viewers of all ages who like science fiction or psychological drama will enjoy The Odyssey a lot, especially if they can see it in sequence from the first season. Flash, Jay and Alpha finally gain admittance into the region of the tower. 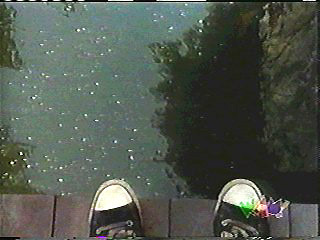 During the first two seasons of The Odyssey, Jay is seen wearing black high top chucks in all of the Downworld scenes, and Upworld in the opening episode of the series. (after that he is mainly viewed in the Upworld comatose in a hospital bed). The best chucks shots occur during the frequently occurring chase sequences and scenes of peril where Jay is captured by various armies of kids, who are vying for control of the Downworld. Trapped on a bridge by Finger’s and Scud’s troops, Jay fearfully stares down at his only escape—the river. With the help of Flash and Alpha, Jay takes the plunge into the river. Jay and Alpha run through the forest to escape from pursuing monitors. 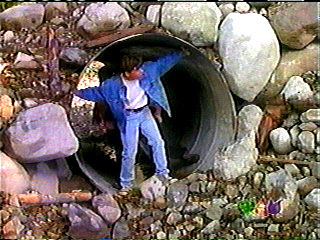 Jay peers out of a tunnel to see if it is safe to continue running. Barr orders Alpha and Jay taken to trial for crimes against Brad. 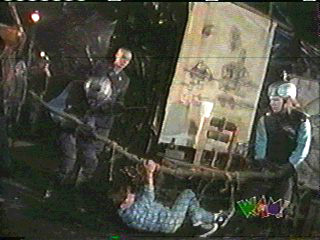 Scud’s troops tie and gag Jay then cart him away to the bridge to be bartered to Finger. Jay watches helplessly from the cart while Scud and Finger negotiate his fate. Captured later by Finger and his men, Jay is brought on a tree branch into the laboratory of the kid scientist Fractal to be lobotomized.